CAPE CANAVERAL, Fla. — The thousands of people who helped build and maintain an intrepid spacecraft over 30 years are now facing the difficult task of saying goodbye to space shuttle Discovery and to a program that has touched so many lives. "It will be very sad to see Discovery's last launch," Anita Pinkosky, who has worked on all of NASA's space shuttles, said before the start of Discovery's farewell STS-133 mission. Part of Pinkosky's job will be to inspect images taken Friday (Feb. 25), the second day of flight, to assess whether the orbiter's heat shield suffered any damage during today's launch. The same process will be repeated before landing to ensure that the shuttle has adequate thermal protection for its re-entry into Earth's atmosphere. "The space shuttle program was just a wonderful thing to be a part of, and it took so many different people to make it happen," Pinkosky told SPACE.com. "It's a beautiful thing to see it launch, and knowing that it's a part of you – that's just indescribable." Pinkosky is one of a unique group of people whose work created the icon of America's space agency. Out of metal parts, wires, valves and circuit breakers, these men and women constructed one of humankind's most complex machines: a reusable winged spaceship capable of hauling seven astronauts and over 53,000 pounds (24,000 kilograms) of cargo into orbit. "The space shuttle program is a tremendous program," said Bill Roberts, who was vehicle manager for Discovery from the early 1980s until 2001. "There has never been an aircraft or spacecraft built like this, and in my lifetime there probably will never be another one like it." As Discovery's vehicle manager, Roberts oversaw the space shuttle's engineering changes and upgrades during the phase known as turnaround flow, which is the time between when the orbiter lands at the end of one mission, and launches to start another. Roberts became Discovery's vehicle manager on the orbiter's seventh flight, STS-26, which was the shuttle program's first return-to-flight mission following the space shuttle Challenger disaster. STS-26 launched from the Kennedy Space Center on Sept. 29, 1988. Discovery would later fly a second return-to-flight mission : STS-114 on July 26, 2005, after the fatal shuttle Columbia accident. "I have a lot of very fond memories, but I would say the most emotional ones I have are from two events: the launch of STS-26, the first return-to-flight, and the launch of STS-114," Roberts told SPACE.com. "They were very proud, emotional moments. A lot of blood, sweat and tears went into the work flows for those two launches, and it all paid off. We learned so much from those tragedies – from a design, processing and on-orbit-operations point of view." The successful return-to-flight missions demonstrated the true capabilities of the space shuttles and revealed the resilient spirit of the space agency and the space shuttle program workers. "Discovery has demonstrated outstanding performance in its flights, meaning it has demonstrated fewer in-flight anomalies than any other vehicle in the history of the program," Roberts said. "That just goes to show the level of attention that was put into the hardware and design of the vehicle – particularly for those return-to-flight missions." Now, Discovery's STS-133 flight is the beginning of the end of the space shuttle program. NASA plans to retire its orbiter fleet later this year after two more shuttle flights – by Endeavour in April, and Atlantis in June. NASA is retiring the space shuttles to make way for future exploration missions to an asteroid and eventually Mars. Despite budgetary constraints, some think the program's retirement is premature. Roberts is one of them. "I think it's a real shame that we're retiring these vehicles so young in their certified lives," he said. "Each orbiter is certified for 100 missions. Discovery will be flying only its 39th flight." People who contributed to the shuttle program over the years considered it a badge of honor. "We were all proud to work for the shuttle program because it was something that no other country in the world had," said Gloria Castellanos, who began her career in Rockwell's configuration management group in 1975. 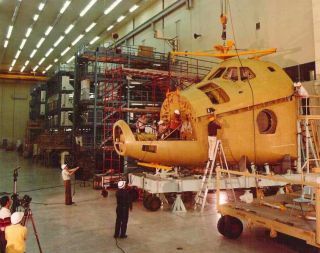 Castellanos' responsibilities included analyzing manufacturing orders and ensuring compliance to the shuttles' engineering requirements. Rockwell was acquired by the Boeing Co. in 1996, and in 2008, Castellanos became part of Boeing's quality assurance program. "We were always a team – we were like a family here," Castellanos said. "It's sad. I was hoping they would continue modifying the orbiters or come up with a new version. I don't like that we will now have to go through other countries to do the things the shuttle can do. I think we should keep the technology here and keep our people working." The ending of the shuttle program will inevitably mean a new beginning for many of those involved, but some within the Boeing community have transitioned into positions that will extend slightly beyond the final three flights. "Ironically, now my position at Boeing is project manager in charge of putting together the plan and requirements to service and deliver the vehicles to the museums," Roberts said. Space shuttle Discovery stands tall at Launch Pad 39A at NASA's Kennedy Space Center in Florida. The "Transition and Retirement" team will prepare the shuttles for the beginning of their careers in the public eye – on display in museums around the country. The roster of institutions that will receive an orbiter has yet to be announced. But for now, the entire focus is on Discovery's STS-133 mission and its final trip to the International Space Station. As for what will be going through Roberts' head when he sees Discovery lift off for the last time? "The same thing that goes through my head every time a shuttle launches," he said. "And that is: safe ascent, safe on orbit, safe operations, and safe landing." You can follow SPACE.com staff writer Denise Chow on Twitter @denisechow as she covers Discovery's final space voyage from Cape Canaveral, Fla. Visit SPACE.com for complete coverage of Discovery's final mission STS-133.